Local bike shops have a place in all our histories. Remember that time when your parents took you for the first time, and you looked around at all the bikes on display – wow! With the focus on internet based shopping these days, the local bike shop still has a valuable place in the cycling community, and not just to service your bike. 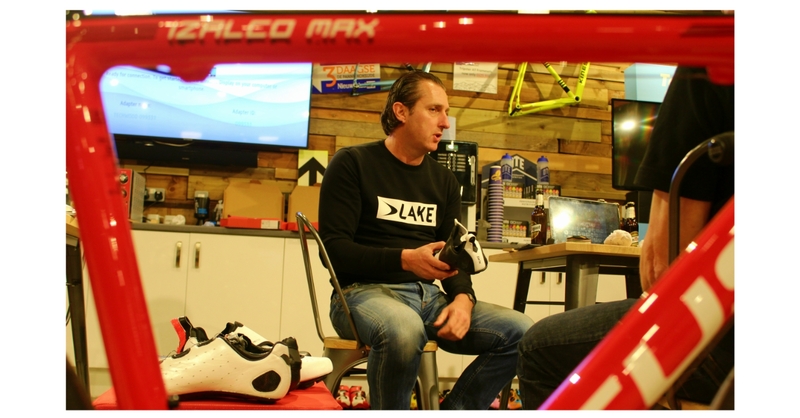 Making sure that you get the right kit, and that the kit actually fits you properly is vital, and Christian from Lake Shoes understands this. Leading up one of the top footwear brands in the cycling industry, Christian values the consumer highly, and so takes time to travel all over the globe visiting shops with his distributors, talking directly with cyclists and retail partners and explaining the technicity of the Lake shoes brand. We caught up with him at NRG Cycles, at Thornaby, on the edge of the North York Moors National Park, during his recent retailer trip to the UK. When you think about it, we spend a lot of time choosing the bike, making sure it has the right gearing, the right wheels and the right finishing kit; but it’s powered by our feet, the hardest working part of the cyclist, never resting. 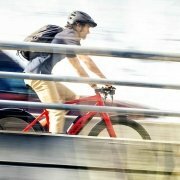 We put them through a physical ordeal in all weathers, and yet, most of us really don’t spend as much time as we ought to when choosing our cycling shoes. The irony is that all of our feet are individual, so no one pair of shoes will fit everyone the same. 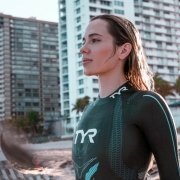 Not only do Lake provide a size guide on the website, but they also provide a fitting service through their retailers, to make sure that you get the right shoes. Listening to Christian, he talked the audience at NRG through the myriad of shoe lasts that Lake produce, and how the foot can vary, and how the measuring process works. Then, carefully selecting individual ranges, it’s time to look at the shoes in more detail as Christian talks the audience through the carbon soles, the molded insoles and the heat molding that really refines the final fitting. Everyone here is sitting forward or leaning in, wanting to take in the wealth of information and knowledge about cycling foot love. Christian details the importance of the fit, the issues with wide feet, not so wide feet, average feet and the various pedals and how they interact with the rider, the foot and the bike, providing the stable base for creating power. In the meantime, we’re guided though the variety of materials used across each shoe style, and how weatherproofing isn’t always best served with leather, and how you’re able to forget the use of overshoes with the CX/MX145 Waterproof Boot model, on both road and mountain bike, from for serious cycling winter foot love. Christian guides us though how the clever people at Lake have designed the ultimate warm weather cycling boot, to keep you riding in comfort through the cold winter days – and yes, it truly is an awesome winter riding boot, designed to keep the feet warm and protected from biting winds and chilled temperatures. However, far too often we can retreat to the internet for impulse purchases, without considering the needs we actually have. 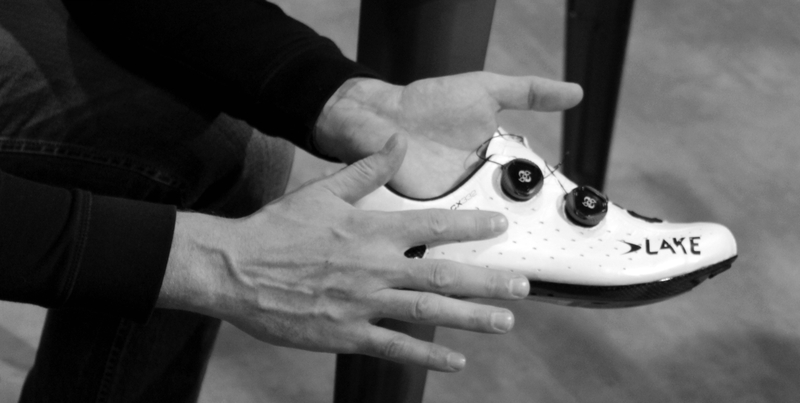 Our feet are truly an important area of business on the bike, and we need to consider them more often. Too often brands change foot beds, change designs, and make decisions based on style rather than performance. Your local bike shop can guide you through the foot love process, and that’s ultimately why Christian takes these sessions. 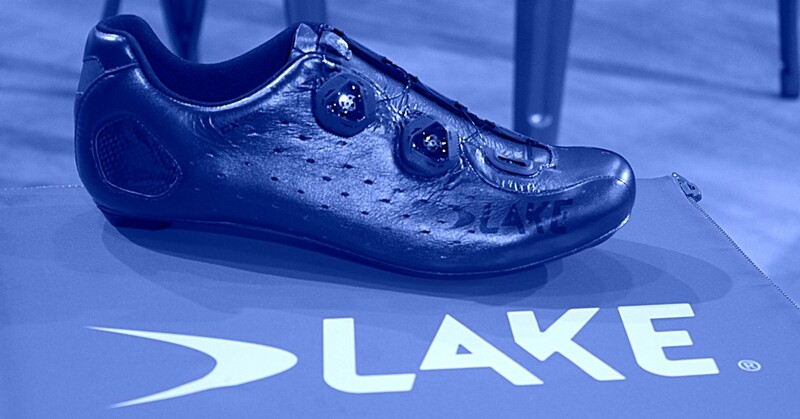 He and Lake understand that vital bond with cyclists and the LBS, and nobody has more passion for the comfort of your feet than this amazing guy. Yes, there are many good brands out there, but only one that will happily share a beer and pizza on a cold autumn night in the North of England, as they share their knowledge with you – and maybe that’s what makes them special. That’s what makes them Lake. Take your foot measurement In a seated position while wearing your cycling socks. Step 1: Trace your foot onto a sheet of paper. After you trace your foot take a ruler and make a line to mark the furthest point on all four sides as shown below. Step 2: Length measurement (Points 1 to 2 as shown below). Use a millimeter ruler to get the measurement of the longest distance from heel to longest toe (first or second toe). Step 3: Width measurement (Points 3 to 4 as shown below). Use a millimeter ruler to get the measurement of the widest distance of foot from side to side. Step 4: Repeat steps for other foot as your feet may be different sizes. Typically you will want shoes that accommodate your largest foot the most comfortably. Please Note: for accurate measurement please obtain a 3 digit millimeter measurement. example: 267mm or 26.7cm will provide the correct amount of data. Accurate measurements cannot be obtained from only 2 digits. example: 26cm does not provide enough data to determine size. Add 5mm to your actual length measurement to get recommended size, it is not necessary to add any additional mm to your measured width.